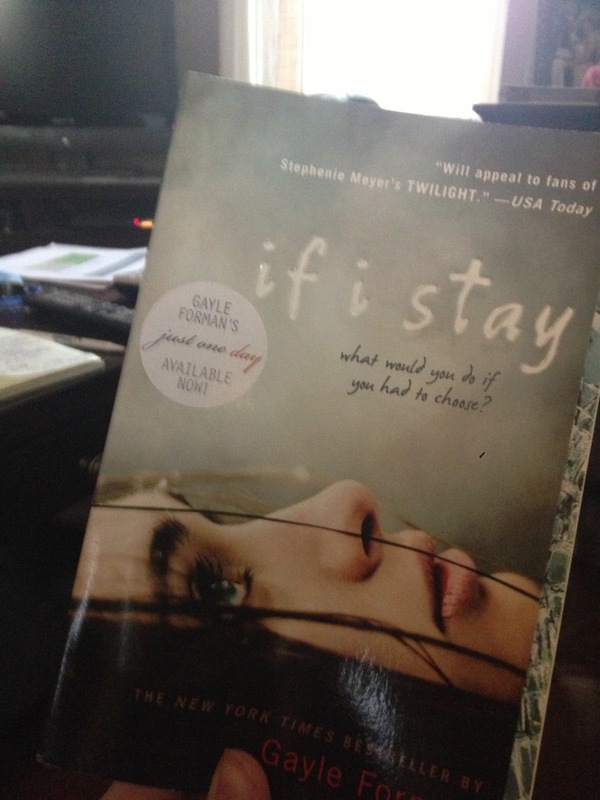 The most recent selection for Julie's blogger bookclub was If I Stay by Gayle Forman. For a long time I was pretty good about participating and posting my review every month, and then I slacked a little bit. But I am determined to get back at it. 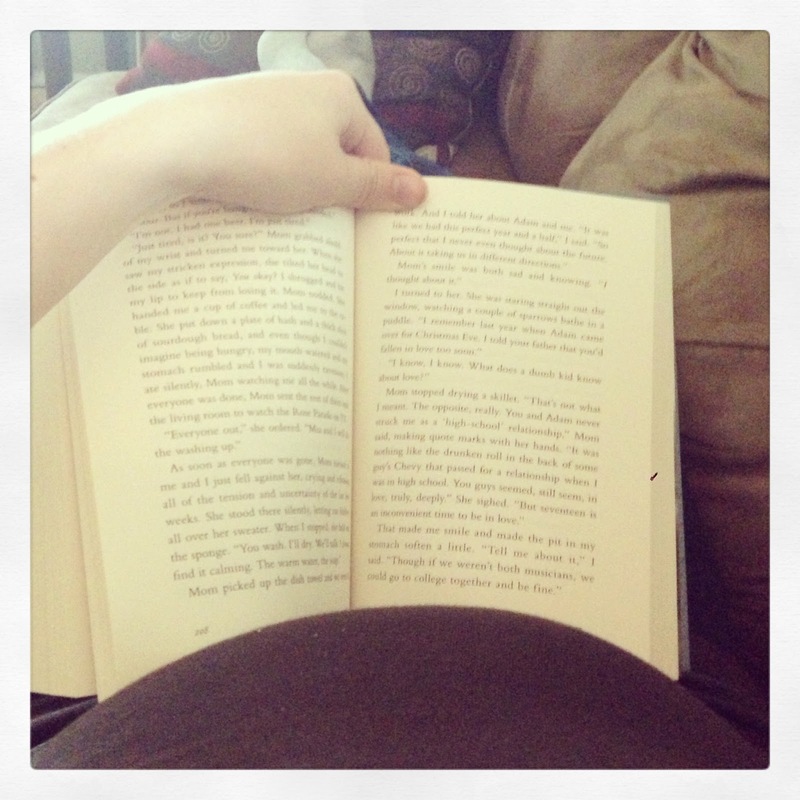 I hope reading will help my mom brain to stay in the adult world at least occasionally! I even have the "real" book this month instead of the kindle edition that I usually have. It makes for a nicer picture. Note: There will be spoilers! This book follow Mia, a 17 year old aspiring classical cellist who is in a car accident with her parents and younger brother. Everyone else dies after being thrown from the car, but she is left in the unique position of being outside of herself to watch her family, friends and boyfriend pray for her to survive and she can make that choice herself. Should she stay, or should she go? Throughout the book we get chances to look back at Mia's life to help us understand her thought process as she tries to make a decision of if she wants to fight for her own life or not. We see her parents and their own lives prior to becoming parents (her father was a musician, the rockstar type, who changed things up and started wearing a bowtie when Mia came along). We also get the see Mia and her musician boyfriend Adam's first date. They seem to have a mutual admiration thing prior to their relationship, admiring the others dedication to the music (Adam is in a rock band that plays for local clubs). We see him plot to take her to see Yo-Yo Ma (the famous cellist) telling her that he just got the tickets free when really he spent a fortune (for a high school kid) to buy them and impress her. We see their relationship develop and change as they get older and start to explore their own futures. In the end, Mia chooses to stay and continue her life, despite losing her entire immediate family. If given the option in this impossible situation, what would you choose? Could this book just as easily be called If I Leave? Why or why not?